Many pet parents may not be aware of how important caring for their pets' teeth is. They may assume that giving their pet the occasional dental chew or hard bone and feeding them kibble is enough to keep their pet's teeth clean, but that's not really the case. This February help pet parents make their pet's dental health a priority with these ideas to promote National Pet Dental Health Month in your pet store. Now's your chance to create some great promotions for dental products this month. 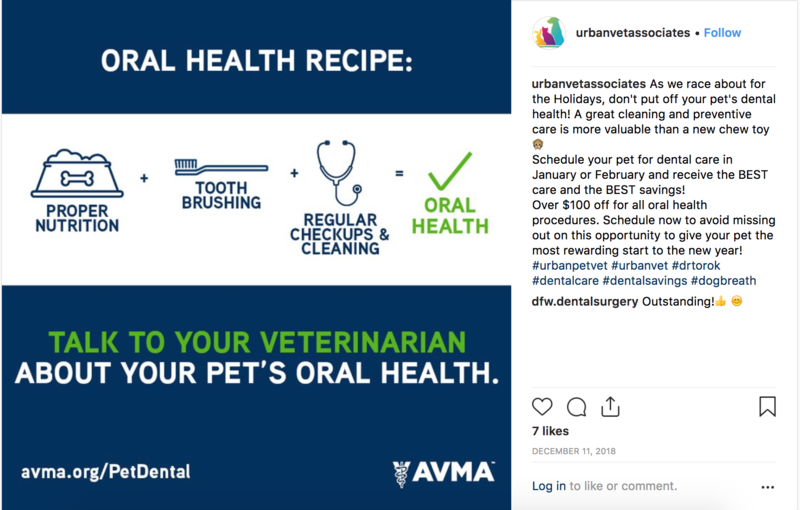 BOGO deals on dental chews or 25% off brushes and toothpaste for pets can go a long way towards encouraging pet parents to start taking serious care of their pet’s teeth. If you use email marketing this is a great opportunity to send customers a coupon for dental products or offer them a discount on a purchase of food when they buy a dental product. Natural Pet Essentials in Charlottesville, VA held a Pet Dental Month sale and offered 20% of dental products in their store during the month of February. It can be easy for pet parents to slack on dental hygiene when it comes to their pets. By putting these products front and center you can catch a pet parent’s attention and remind them that they need to add dental care products like toothpaste, brushes, and dental chews to their shopping lists. Here is a great example of a dental display in the store Leash on Life in Iowa City, IA. This display is sure to catch a customer's attention since it is well organized and full of product. There are so many options for pet parents to choose from, so make it easier by switching up the products on the table weekly. This is an easy way to promote all your products without overwhelming customers with the options available. Consider adding informational materials by your display so customers can learn more about their pet's dental health as they shop. Help your customers identify the warning signs of dental disease with this free infographic. Help boost sales during the month of February! There is a lot of information out there to help your pet parents learn about proper dental care. Invite them into your store for an information session about recognizing the signs that a pet may be developing dental disease. You can help parents understand how things like gingivitis and periodontal disease can have an effect on more than just your pets' teeth. You want to be ready to answer any questions a pet parent may have and this Q&A should definitely help. If a pet appears to have already progressed to stage 3 or 4 of periodontal disease urge pet parents to bring their pet to the vet. At that stage water additives and brushing won't help and they will need to seek the help of a professional. 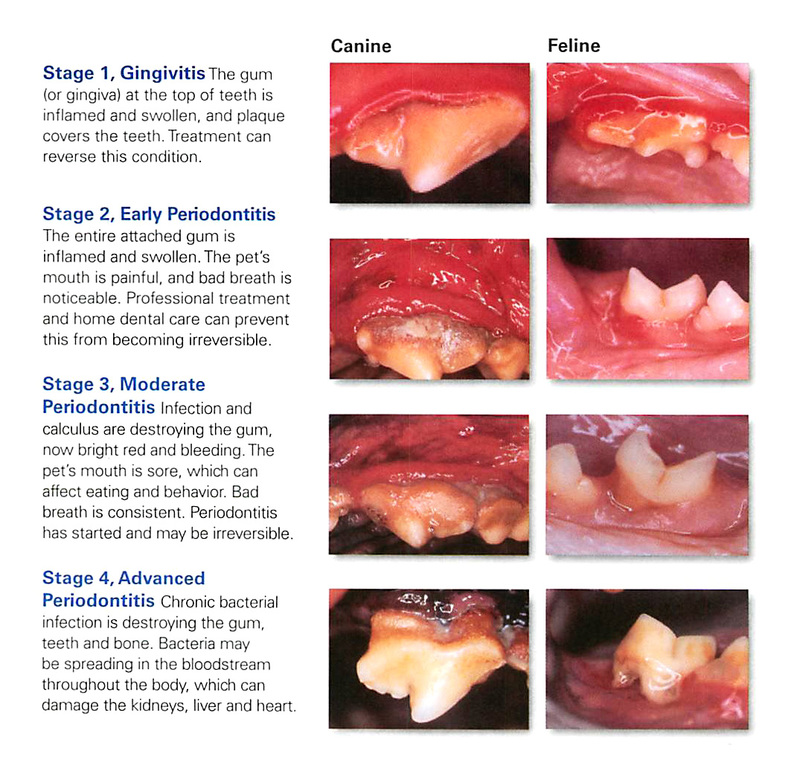 This is a great visual you can share with customers to help them understand what the progression of periodontal disease looks like, it's not pretty, but it is important to help understand the severity of this issue. As the event goes on show customers products to help care for a pet’s teeth and how to best use them. Share some educational materials about dental health they can take home along with a coupon and customers are sure to pick up a toothbrush before leaving that day. You could even partner with a local veterinarian to offer a dental cleaning demonstration. They can show your customers the proper way to brush their pet’s teeth while also driving business to their clinic. Combine that with a coupon for some of the products you shared with them your event is sure to be a success. Take a video of the demonstration to share on social media after for those who did not attend. Bark! 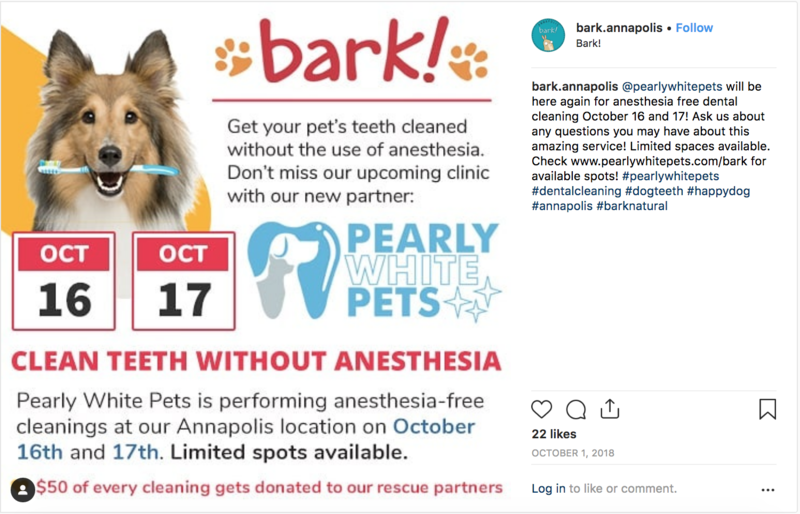 in Annapolis, MD recently partnered with Pearly White Pets to hold a dental cleaning event that donated a portion of the cost of each cleaning to local shelters. Many people can be hesitant about putting their pet under anesthesia to get their teeth cleaned or they just can't afford to get their pet's teeth cleaned as often as they need to. This is a great opportunity to get customers in your store by partnering with an organization that can do anesthesia free dental cleanings. Do some research and see if you can find a reputable organization to perform anesthesia free dental cleanings in your store during February. It can be considerably cheaper at $250 – $350 for a cleaning versus the usual $700 for a cleaning with anesthesia. Events like this are the perfect opportunity to promote dental products for customers to use between cleanings. As I am sure you already know, social media and email marketing are great resources for you to establish yourself as a trusted resource to pet parents in your community. National Pet Dental Month gives you the opportunity to educate your customers and local pet parents about pet dental health. Share some statistics and tips on social media about dental health to help keep pet parents informed. Urban Vet Associates in Westmont, IL shared this helpful infographic as a little reminder to keep on top of your pet's dental health. Studies show that more than 50 percent of consumers want to see videos more than any other type of content. A dental demo is the perfect way for you to utilize a video format in your online marketing. You can share a video showing the best technique to brush a pet's teeth at home on your Facebook or even embed it into a monthly or weekly newsletter. The American Veterinary Medical Association has many informational videos that are perfect to share on Facebook or embed in an email newsletter. Neglecting a pet’s dental health can lead to serious conditions such as gingivitis, heart disease, lung disease, and kidney disease. Join the movement to bring awareness to pet dental health by promoting it in your store. You are a valued resource for pet parents in your community and your recommendations matter to them. Use that trust to help protect pets’ dental health by participating this February. How do you promote dental health in your store? What are your favorite dental products on the market? Leave a comment below and start the conversation!